A subject that has sadly been on everyone’s mind a lot this year, similar to past years, is fire. The fire itself is such a danger to us all in many ways: the threat to life, wildlife, forests, property, culture and business. As we all know the smoke has caused many negative effects around British Columbia, and for us in the tourism business there will likely be a lasting impact. It has been great to see many organizations step up and ensure clear communication for potential visitors to our area so they were able make informed decisions. We at Baldy Mountain Resort in the Okanagan, BC have been taking steps to ensure our community is protected if a fire heads our way and to answer your question yes, one is due. It was in the 1930’s when a fire last moved through this area and we are led to believe, by the experts, that 80 years is pushing the life expectancy of a forest in this region and that fire is the natural way to start regrowth. Due to these facts, Baldy Mountain Resort applied for a FESBC (Forest Enhancement Society of British Columbia) Grant a few years ago and got it! The grant money covers the planning and implementation of a firebreak around the community. Working with Experts at Davies Wildfire Management, The Mountain Resort Branch, OIB, FES and PWC we finally started the prescription on September 12th, 2018. It really was an extensive process to get to this point involving many meetings, coordination with parties involved, environmental assessments and much more. 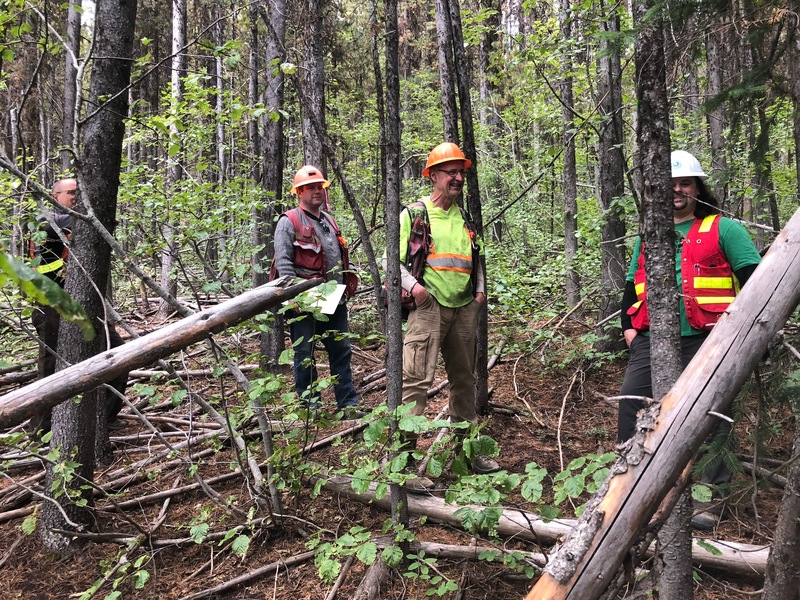 It was also key for Baldy to get engagement from the local community and we have seen a large supporting response despite the fact machines will be loading trucks at 2-3am and cutting wood from 5-6am. The other key goal, on top of creating a fuel break, was the aesthetics of this work. As a ski resort the look and feel of the area is very important to us and we are blessed with very few foresting activities being visible from Baldy. So, what does this all mean? The prescription is a 350 – 400-meter-wide horseshoe shaped band that stretches from the gravel pit down past the snowshoe trail, across the main road, around the future sub-division and up to the meadow. The main concept is to increase spacing between crowns and remove forest floor fuels, so if and when the fire comes, it is lowered in intensity allowing firefighters to battle it successfully. We would like to stress that this is not a clear cut, but a thinning of trees. The ideal wish is for a 10-meter gap between trees leaving behind something similar to well-spaced gladed tree area. But in reality, the forest is not uniform and we need to ensure that we leave trees that are not too old (that will die soon) and also some room for regrowth. This ultimately leads to more random spacing and some clumping of the tree’s that are left. Post-tree harvesting we then come through and remove floor fuels – quite a task as there are already extensive fuels, plus what is left from the tree removal. Timeline wise; we estimate 6 – 8 weeks for the removal of the trees and then we can start on the forest floor fuels. This second stage will likely run into next spring and if all goes well, in time for dry summer months. Setting a bench mark: Baldy attained it’s grant in the first year of the FESBC grant being made available and although other resorts have done similar work, we at Baldy are aiming to set a benchmark for how to successfully complete the prescription, while leaving an atheistically pleasing environment. We are under no illusion that for a while, and as the area starts regrowth, the forest will not look amazing. To do the work, access roads for the equipment need to be built, and landing areas for loading the wood need to be created, but rest assured that all snowshoe trails, cross-country, and hiking trails will be maintained and protected. Future potential: We will have to wait and see the finished prescription, but all of us at Baldy are excited about the potential this spaced forest may have. There could be opportunity for expanded snowshoe and cross-country trails as well areas for mountain biking, hiking and maybe even a campsite! This was not our goal, but we are keen to see what opportunities come from this. Ultimately, this break will help protect the community of 100+ cabins and our great local ski hill for years to come, and this is what it is all about.